Hinduism is the most prevalent religion in Bali. Going back to several hundreds of years, the majority of Balinese have kept up this religion but in the course of time, this religion and its rituals have evolved and have taken unique Balinese characters. The temples in Bali show case characteristic Balinese architecture. In addition, they were constructed at strategic locations. The landscape around these religious sites is beautiful but the temple structures lend Bali characters nowhere else to be found in the world. Most Balinese dances have religious overtones or they portray popular Hindu myths/legends that originated in India but again, have taken on Balinese elements over the course of time. In addition to the numerous religous artefacts, practices, ceremonies and rituals, Bali is also known for its art, especially wood carving and painting. The level of wood carving skill in Bali is really high and it is in a class of its own. Seeing skilled wood carvers go about creating exotic statues will open your eyes. Furthermore, the people in Bali exude friendliness. Yes, they welcome you and, of course, your tourists’ dollars alright but I could detect that their feeling was genuine on many occasions. During my visit in 2008, just by a strike of luck, I had a chance to witness a cremation ritual. According to the religion and tradition, after death, the body must be dissolved and returned to its original elements. Ngaben, the Balinese word for cremation is a purification rite which frees the spirit from its temporary earthly house and facilitates its journey to its next existence. For that to take place, a good day was selected and the preparation can take a few weeks. Since that particular Ngaben was for a high priest, which is referred to as Palebon, it was very elaborate. Photographically, it was a very colorful treat. Bali’s popularity on an international level did backfire; it became the bombing target on two occasions. The first and deadliest took place in 2002 and the second one in 2005. Bali did recover quite nicely since then but I felt bad that such a peaceful place, full of peace loving people, was tarnished with that kind of violent act. It simply felt out of place…. Not only I would like to share the images here but I also would like to be reminded that there is still a tiny paradise on earth, in the midst all the adversities taking place in the world. I only had beautiful memories of Bali. Right after the first bombing, I posted images from scanned slides that I took in 1992 during my first visit to Bali. Fourteen years later, in 2006, I went back to Bali and more recently, in April of 2008 and 2010. Instead of starting a new gallery, I decided to update the existing gallery and compile the images from all the visits onto this gallery. Another aspect about Bali that I like, even during the most recent visit, and this time it is more from a photographer’s perspective, that the sky was pretty clear from industry-related haze I noticed in quite a few Asian countries I visited in the last 10 years or so. I hope it can be kept up that way. The sunset along the north shore of Bali was great but the sunrise on the following day was simply spectacular. I went back to Bali in April 2010. This time around I tried to capture images I felt I didn't during the previous trips to showcase Bali some more, including but not limited to two traditional Balinese dances, some beautiful rice terraces and religous ceremonies. This time around, I found myself capturing Balinese people more and more. Enough that I decided to put those images in a separate sub-gallery. From photographic point of view, I did some high ISO 3200 shots but also time exposure shooting. In addition, I used prime lenses on both Canon and Leica setup for that shallow depth-of-field effect. Thank you for visiting and enjoy the images. Like always, please feel free to leave any comments on the gallery or on the images as you see fit. Great work. Thanks for sharing these. nice gallery.. well shot and edited ! A pleasure to see this beautiful gallery on Bali. 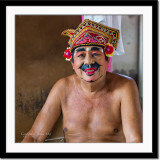 Great images showing the beauty of the island as well as the beauty of the Balinese's culture. V.
This is a " Fabulous Gallery " ! Beautiful in : " any way " ! The quality level is very high ! Realy the work of a " Master " ! I can not give a comment , because you have so many little master piece ! For me it's perhaps your best gallery . So i can give you just my best vote : " The Ultimativ Best Vote " !